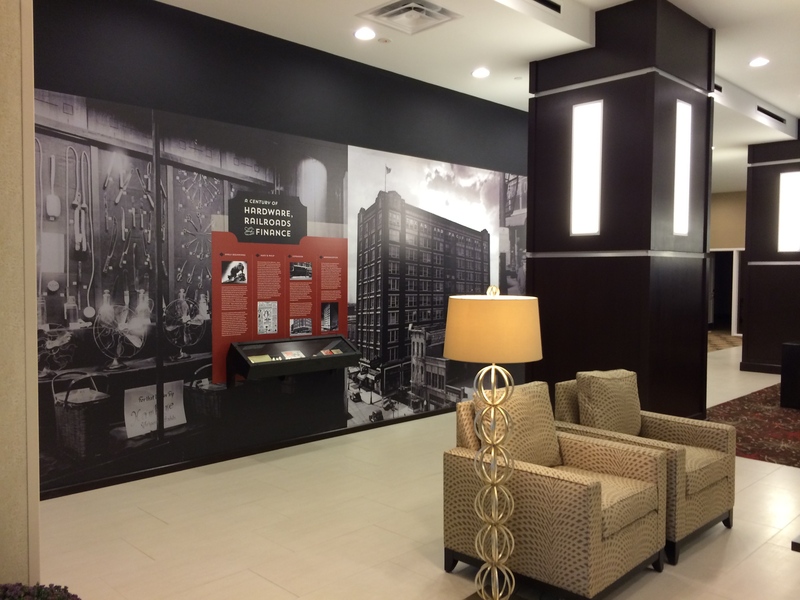 This project for Homewood Suites by Hilton focused on telling the history of a building in downtown Dallas. The building — which went through a “modernization” in the 1960s — featured little historical character despite having been built in 1913. The challenge: create a dynamic focal point in the lounge that incorporates historical elements and tells the story of the 100-year-old building. First, the building’s history was researched. Utilizing resources of the Dallas Morning News archive, Dallas Public Library and Dallas Historical Society historic photos were located and verified. A narrative was drafted based on news clippings and former tenant information, resulting in a story that spanned decades of interesting tidbits and facts and surpassed initial expectations. A theme of “Hardware, Railroads and Finance” was developed which separated each period into a separate chapter. After photos had been sourced, these were scanned and combined with the narrative to cover a 30-foot-long, newly built wall in the hotel lounge. Colors, tones and scale were all carefully considered to work with the interior designer’s plans for the room. Black and white photographs were enlarged to create a mural affect, and the narrative was centered in a smaller interpretive zone. Utilizing custom wall vinyl applied over a primed wall created a uniform, durable surface that did not project into the walkway. Artifacts from the building’s past were located and purchased to accompany the interpretive zone in a custom-designed wall display case. 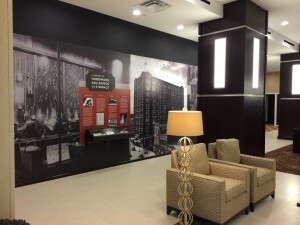 The end result is an artistic focal point that complements the design of the hotel lounge and encourages guests to learn more about the history of the unique property in downtown Dallas.